All hopes of making the Guinness Pro14 play-offs evaporated for Cardiff Blues in Galway on Saturday afternoon as Connacht secured their path to Heineken Champions Cup rugby in extremely contentious circumstances. Attention now turns to Judgement Day and a winner takes all clash with the Ospreys to get into a Heineken Cup play-off against the fourth place side in Conference B, but first the fall-out from this game is likely to rumble on for a few days. Head coach John Mulvihill was dealt a blow in the week, despite Dmitri Arhip and Jarrod Evans returning to fitness, as free scoring Aled Summerhill and big carrying Nick Williams were ruled out through injury. Playing into a gale force headwind at the Sportsground in the first half, Nick's bulldozing would have been crucial as kicking the ball clear was not an option, but Cardiff Blues still made a bright start to proceedings. A 24-phase attacking phase pushed up to the edge of the Connacht 22, but an isolated ball carrier would be turned over in what would become an ongoing issue for the away side as the game dragged on. From that the hosts, with the wind behind them, kicked deep into our half and set up an attack which eventually saw Paul Boyle break through a gap in our fringe defence and offload for scrum-half Caolin Blade to go over for the first try of the game, converted by Jack Carty. Questions are to be asked about whether Boyle was legal when reaching back from the ruck to make the initial break, and whether his offload for Blade was forward or not, but the try stood and Connacht were ahead. However, it wasn't for too long as Cardiff Blues won the ball back from the kick-off and would spend the next 10 minutes or so in the opposition half. Two attacks came and went, but the home side could not clear their lines until on the third attack Gareth Anscombe put Owen Lane into a gap for the winger's 11th try of the season. The conversion would draw the scored level with 20 minutes gone, as Connacht looked to hit back quickly, camping inside our 22 and asking questions of the defence, which we answered well during phase play. Eventually though a driving maul set up after an infringement in midfield saw the home side shove their way over the line, with second row Gavin Thornbury credited with touching the ball down and Jack Carty nailing a superb conversion from the touchline. That would be it for first half scoring though, with Cardiff Blues undoubtedly the happier team going into the sheds at half-time knowing they now played with the wind at their backs and were just seven points down. However, Connacht flew out of the traps after the break, making a smart break down the left wing before Rory Thornton was penalised for a high tackle in front of the posts and Carty defeated the wind to add three points to the home lead. Then from the kick-off it was another break up the left, stopped just inside the Cardiff Blues half, but quickly recycled for Carty to break, kick ahead and re-gather before carrying over the try line and converting his own score. Rhys Carre came off the bench to quickly win a penalty on the floor which Gareth Anscombe kicked, to cut the deficit, but what happened next leaves a sour taste in the mouth for the visitors. 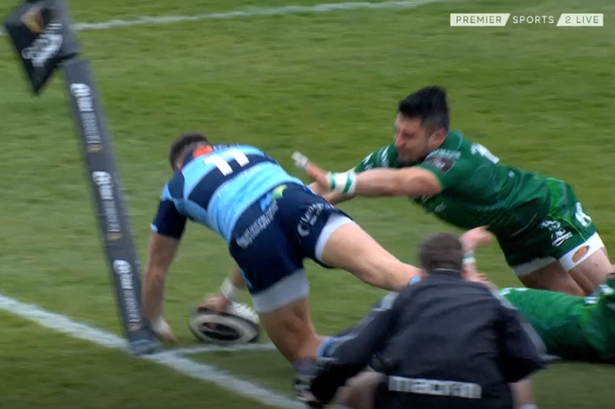 Connacht tried to play out from deep again but the ball was lost in contact and Seb Davies sent Jason Harries towards the corner, with the winger bumping off one tackle before reaching to score. Referee Mike Adamson went upstairs once again, and although replays confirmed that Harries had scored before his hand touched anything other than the corner flag, the TMO advised he was in touch and scored simultaneously, therefore an attacking scrum was awarded. In the end it was the 71st minute, rather than the 60th, when Cardiff Blues scored our second try of the game through a driving maul with Josh Turnbull the beneficiary. Anscombe converted superbly from the touchline, but then the third contentious decision. From the restart Robin Copeland rose to try and claim the ball, but there's a case to say he knocked it on in the air and as the ball went to the ground, before Owen Lane was pushed out of the way when trying to cover the hack on. In the end, Matt Healy collected and touched down to send the game beyond doubt. With seconds left on the clock there was still just time for the now compulsory Cardiff Blues first phase strike play, with the officials unable to chalk off a Jason Harries score on this occasion. It secured a losing bonus point but that was little consolation on the day. All that was left when the final whistle blew was a sense of injustice, that our last chance of Heineken Champions Cup qualification was taken away in controversial circumstances and we are now left to fight for a Heineken Cup play-off place. Of course if the Jason Harries try had been awarded then there is no certainty that we'd have won, but nine points down with 20 minutes to go and on the up with the wind behind us we would have been in a great position to push on. It opens up questions of referee competency again, with John Mulvihill quoted earlier in the season as saying he has had confirmation that there was a major refereeing error in our opening three matches of the season, and also infuriated by the refereeing away at Ulster. Worse than that it opens up the question of the league's integrity when Irish TMOs are making key decisions in games that directly benefit Irish teams. It is not a good look whether you believe in conspiracies or not. Hopefully the powers that be can highlight this once again to the league's blazers, but for now the players and coaches can only use this feeling to fuel a massive performance at Judgement Day against the Ospreys. Great report on the Connacht match - not just Irish officials but Clancy in particular. With the news about Gareth Anscombe it is to be hoped that we do not allow him to play against the Ospreys with so much riding on the game for next season.